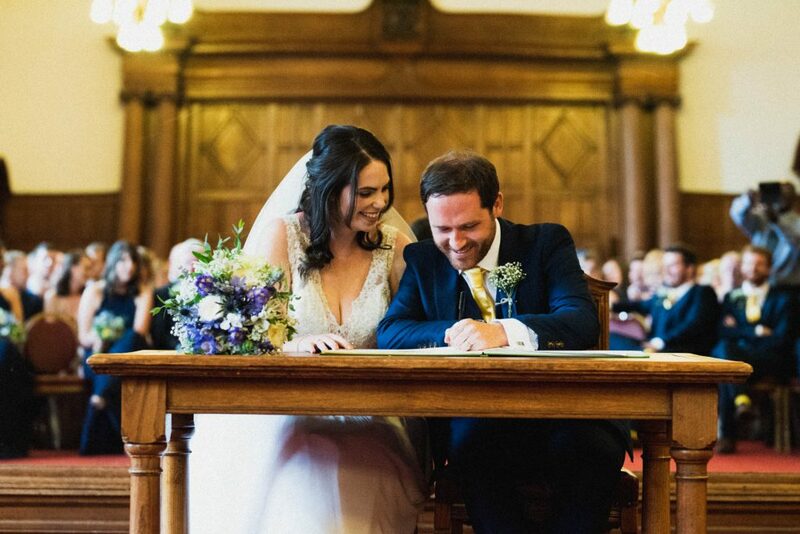 For many, planning a Sheffield Town Hall wedding is a great option. For one, it saves you the cost of having to bring a registrar out to your wedding venue. Not to mention the fact that the Sheffield Town Hall is a particularly grand setting for any occasion. 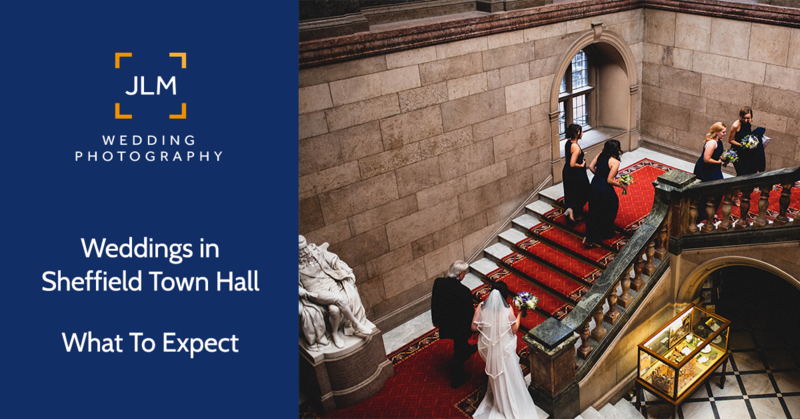 If you have never attended a wedding at the Town Hall in Sheffield before then you might not know what to expect. That is, until you spend a few minutes reading through this article. You need to remember that you are in the middle of Sheffield City Centre, so parking is limited. Well, to be fair, it isn’t limited so much as expensive. 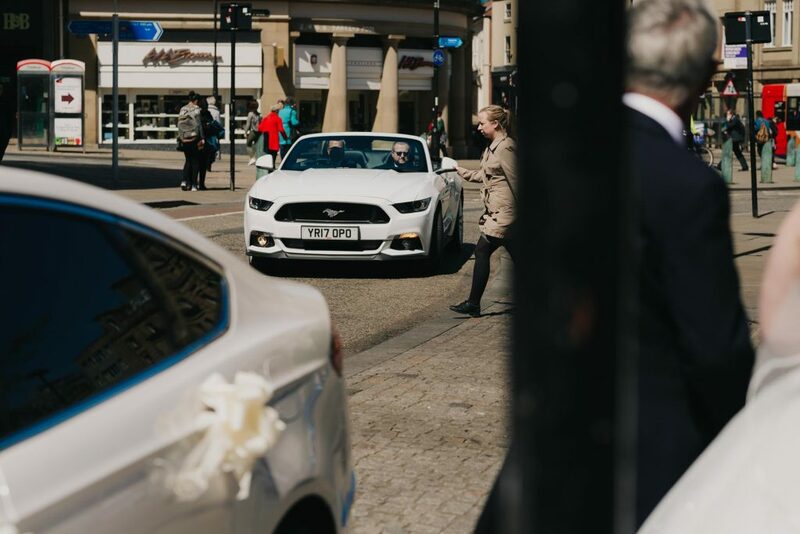 Fortunately that shouldn’t be a problem for the bride since official wedding cars are permitted to park outside the front of the Town Hall for the duration of the wedding ceremony. 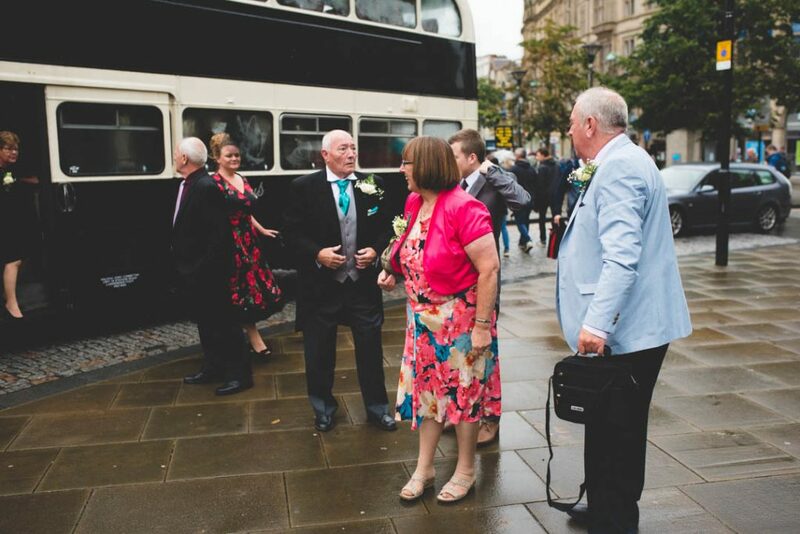 One option is to arrange for a bus to bring your guests from the reception venue into town, thus saving them the trouble of finding parking. That’s exactly what Susan and Kevin did to get their guests to and from the Ibis Style in Barnsley. Many brides-to-be worry about being seen by guests at their arrival. After-all, their arrival in front of the Sheffield Town Hall is unlikely to be discrete. Fortunately, the attendants at the Town Hall are particularly good at this. They will make sure all the guests are safely tucked away in the ceremony room before the bride’s arrival. 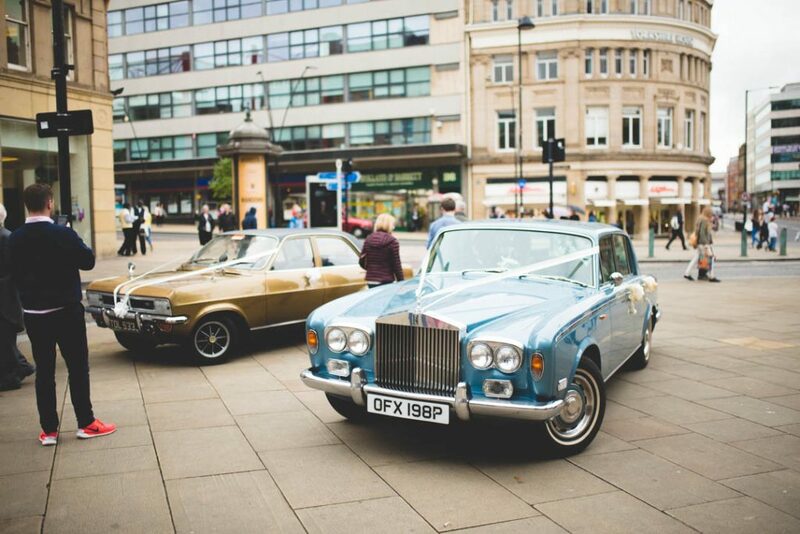 The wedding car has the added advantage of being able to park outside the Town Hall for the duration of the ceremony. Having said that, I’m not sure they would usually be allowed to park on the pavement like they did at Kay & Lynval’s wedding. Sorry fellas, the arrival of the Groom at a wedding at the Town Hall is much less grand. Basically you’ll just arrive at some point, probably about half an hour before your appointed ceremony time, to greet your guests. Shortly before the bride is due to arrive the Groom will be taken into the ceremony room to be interviewed. Once the interview is complete the guests will be invited to take their seats in the ceremony room. Most Grooms opt for the discrete arrival, often with a stop at a local city centre pub for a pint of Dutch courage. Some prefer to savour the moment by arriving in style, much like Steve’s arrival in a Mustang. If you want photos on the main staircase get them before the ceremony. You are not likely to be allowed back afterwards because another wedding party will be arriving after you. After the ceremony you will be ushered out of the building via a different exit, i.e. not the main entrance with the staircase. This makes it tricky to get photos of both of you together since you won’t actually see each other before the ceremony. In my experience, some have used the time for a ‘first look’ photo. 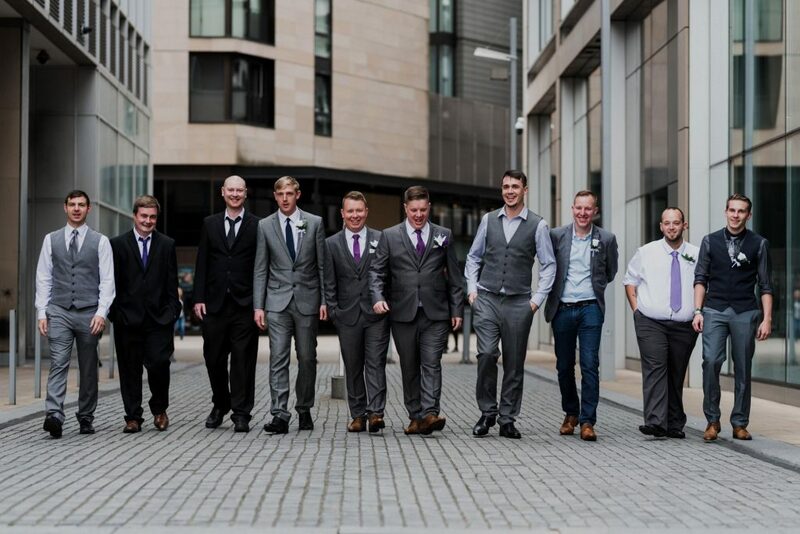 Most of the time it is a great chance for photos of the Groom and his Groomsmen to get some snaps together. 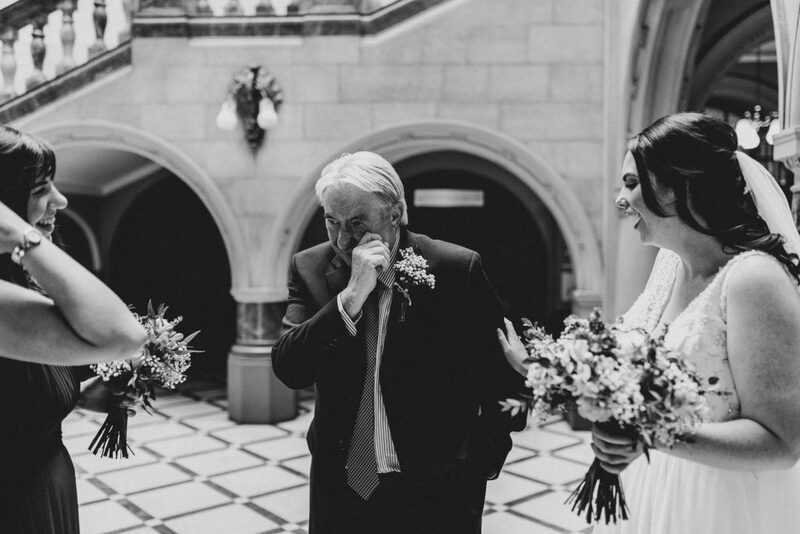 It is also a good place for photos of the Bridal party, not to mention that special moment where the Father of the Bride sees his little girl in her wedding dress for the first time. How Long is the Wedding Ceremony at the Town Hall? This can depend on whether you invite guest to perform readings. Typically the ceremony lasts about 20 minutes from the arrival of the Bride to leaving the room. To be honest, I'm probably not the right photographer for you. The Sheffield Town Hall has several rooms typically used for wedding ceremonies. Downstairs are three smaller rooms connected by a large anti-room which is used as a waiting area for guests prior to the ceremony. This waiting area is the first room you enter as you turn right through the main entrance. These smaller rooms host several wedding ceremonies a day and are best suited for parties of up to 50 guests. Upstairs is a much more private affair, better suited to larger wedding parties. The main room is partitioned to form a ceremony room and a drinks reception room. The Mirror room is where you will have the ceremony, so named because of the huge mirror at one end. The main dividing wall lifts away at the conclusion of the ceremony allowing guests to wander freely across to the Mandela room for drinks and canapes. This is more a tip for the photographer than anyone else. The huge mirror in the Mirror Room is right in front of the couple as they get married. It then stands behind them as they sign their contracts. My advice, stay low and always check for your own reflection before you take a photo! Confetti - Where and When? For ‘downstairs’ weddings where you are lead out of the side exit, that staircase is the place for confetti. You might want to ask your guests to line the walkway and throw their confetti as you pass them. You can also wait until you get to the main path and do the same there. However you do it, keep it outside! After the ceremony you may be thinking the Peace Gardens would be an ideal spot for photos. Whilst that is true in principle, keep in mind that on a sunny Saturday afternoon it will be packed! Not to mention that in August it will be overtaken by Sheffield By The Seaside, so you will have no chance. My advice is to either make use of the nearby Winter Gardens, or look for interesting locations between buildings for your group photos. 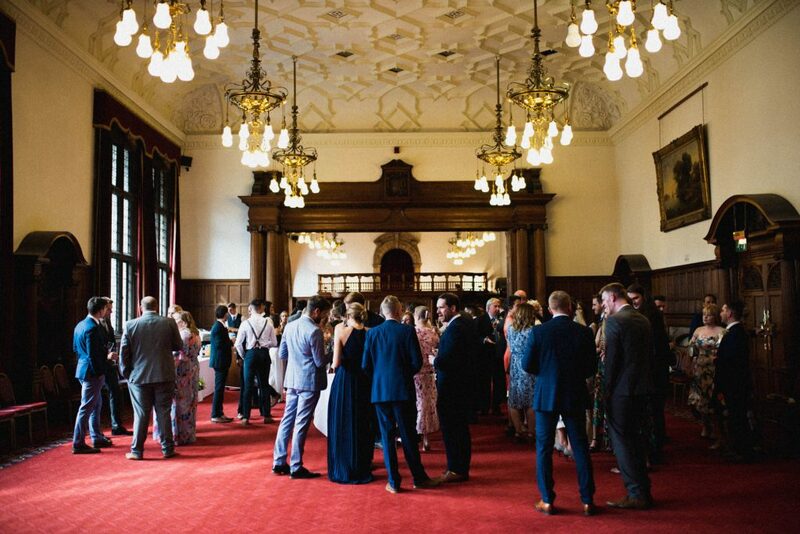 If you have never been to a wedding at the Sheffield Town Hall before it may seem a little intimidating. Hopefully this guide has helped you to understand what you can expect, where you should go and how to make the most of your wedding ceremony. As you can probably tell, I have attended more than my fair share of weddings at the Town Hall. If you have any questions that I haven’t covered in this article please feel free to ask. 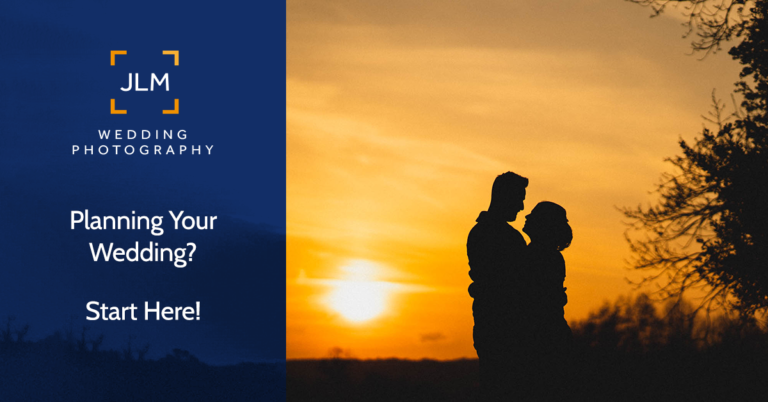 If you would like to talk to me about photographing your wedding why not Get In Touch?